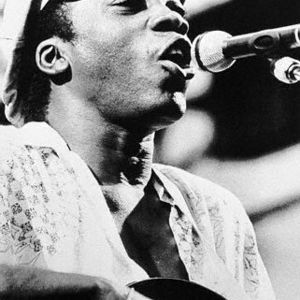 Milton Nascimento (born 26 October, 1942) is a singer-songwriter who is considered one of the icons of Brazilian Music. Nascimento was born in Rio de Janeiro, and grew up in Tr?s Pontas, Minas Gerais. His mother was the maid Maria do Carmo Nascimento. When he was just a few months old, the boy was adopted by the family for whom his mother had previously worked: the couple Josino Brito Campos (a banker, mathematics teacher and electronic technician) and L?lia Silva Campos (a music teacher). He lived in the boroughs of Laranjeiras and Tijuca in Rio de Janeiro. Nascimento was born in Rio de Janeiro, and grew up in Tr?s Pontas, Minas Gerais. His mother was the maid Maria do Carmo Nascimento. When he was just a few months old, the boy was adopted by the family for whom his mother had previously worked: the couple Josino Brito Campos (a banker, mathematics teacher and electronic technician) and L?lia Silva Campos (a music teacher). He lived in the boroughs of Laranjeiras and Tijuca in Rio de Janeiro. When he was 18 months old, his biological mother died and he moved with his adoptive parents to the city of Tr?s Pontas, in the State of Minas Gerais. In the earlier stages of his career, Nascimento played in two samba groups, Evolussamba and Sambacana. In 1963 he moved to Belo Horizonte, and his friendship with the Borges brothers (Marilton, M?rcio e L&ocirc; Borges) led to the Clube da Esquina ("corner club") movement. Other members included Beto Guedes, Toninho Horta, Wagner Tiso, and Flavio Venturini. Nascimento is famous for his chime-clear falsetto and tonal range, as well for highly acclaimed songs such as "Can? ?o da Am?rica" ("Song from America") and "Cora? ?o de Estudante" ("Student's Heart"). The lyrics of "Cora? ?o de Estudante" remembers the funeral of the student Edson Lu?s, killed by police officers in 1968. The song became the hymn for the diretas J? campaign in 1984 and it was also played in the funeral of the late president Tancredo Neves the next year, who died before assuming the presidency. While his reputation within Brazil was firmly established with his Clube da Esquina works, Nascimento's international breakthrough came with his appearance on jazz saxophonist Wayne Shorter's 1974 album "Native Dancer". This led to widespread acclaim, and collaborations with American stars such as Paul Simon, James Taylor, and Pat Metheny. Through his friendship with guitarist Warren Cuccurullo, Nascimento came to work with the pop-rock band Duran Duran in 1993. Nascimento co-wrote and performed (in the Portuguese language) the song "Breath After Breath", featured on the band's 1993 album "Duran Duran". He also performed with the band in concert when they toured in Brazil, in support of that album. Nascimento earned a Grammy award for "Best World Music Album" in 1998 for his album "Nascimento", and was also nominated in 1991 and 1995.